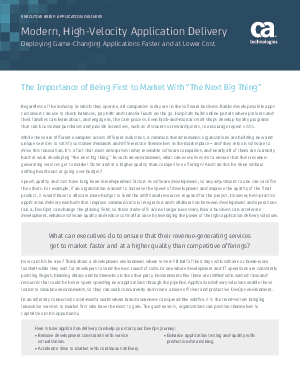 Today’s organizations are challenged to be the first to market with ‘The Next Big Thing’. They must innovate with new and unique services to satisfy customer demands and differentiate themselves in the marketplace. Software drives that innovation and has turned every organization into a software organization. This Executive Brief describes how the efficient collaboration between the development and IT operations teams can bring high-quality applications to market as quickly as possible. •Accelerate application development by removing constraints with CA LISA® Service Virtualization. •Expedite release time with CA LISA® Release Automation. •Improve application testing and quality with CA LISA® Pathfinder.